Lance’s top creative tip: Experience is everything! I have tried to do as much as possible in this life, experience as wide a slice of this world as I can. Everything you do and every conversation you have will form part of the worlds that you create in your writing. 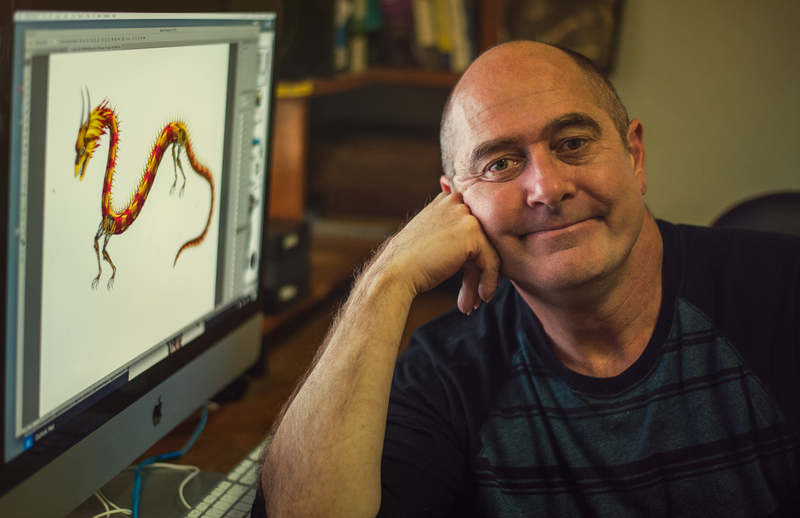 Lance Balchin studied photography at the University of Tasmania and went on to complete a Masters of Arts and Bachelor of Laws. Lance has worked as a head chef, co-owned a media production company, worked in fashion photography and fine art portraiture, and taught adult photography and film making. 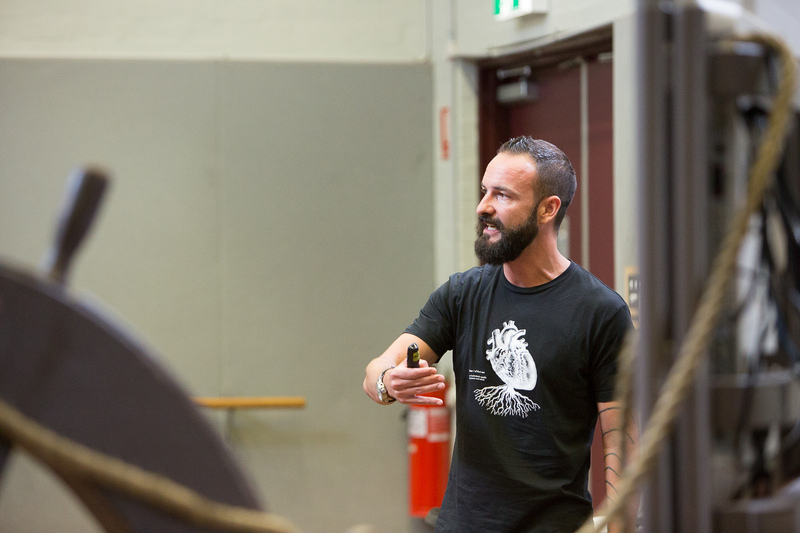 Lance was mentored by many of the original pioneers of the emerging Melbourne gonzo arts scene. The influences of Tom Waits, George Orwell, Patti Smith and Bukowski have always led his writing and image making. Lance is based in Brisbane. Why do you write? I think that I write, illustrate and take photographs for the same reason; to communicate the way in which I see the world around me to others. The visual arts and literature are ways of performing to an audience and I love the idea that that audience could be anywhere and that my illustrative and written performance might move them and create an invisible connection between me and them. What would you be doing if you weren’t a writer? I’d work in community law. 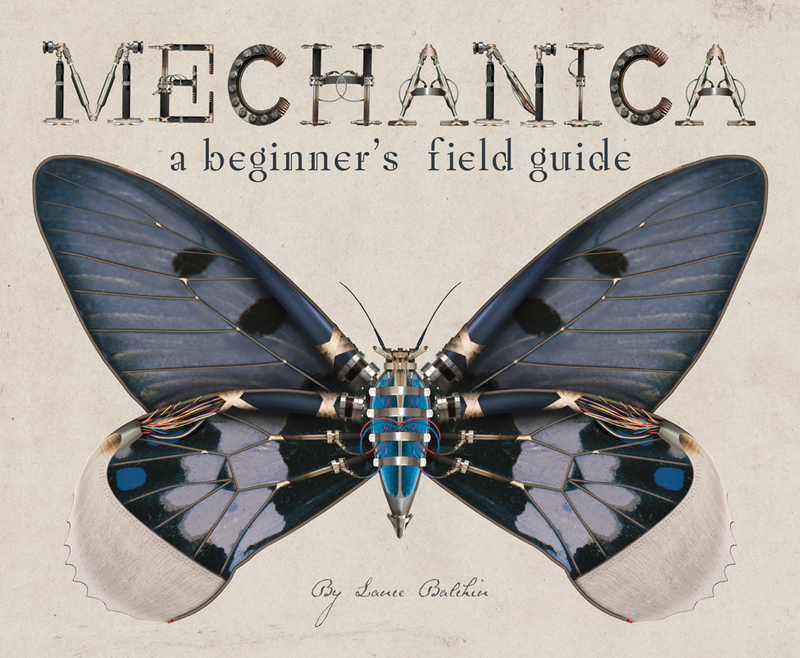 I finished a law degree at the same time as getting the first publishing deal with Five Mile Press and have been too busy working on the Mechanica series to take it any further. I’d only be interested in working within my community to help people to whom the legal system offers little chance of substantive justice. I grew up in the working class suburb of Collingwood in the late ’70s and saw the importance of community action and support organisations. What was your toughest obstacle to becoming published? Realising that what I had was a book. I’d finished a dozen illustrations and was thinking about exhibiting them in a gallery but then realised I could build a narrative around them. 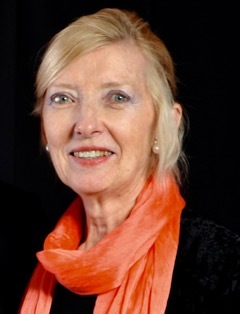 I was very lucky to find Karen Tayleur at Five Mile who has supported and helped develop the concept ever since. How involved have you been in the development of your book? I have done all the illustrations and writing for the books. The team at Five Mile helped polish the graphic design. I’ve also developed a range of video and online content to help support the books. What’s the best aspect of your writing life? At the moment it is the ability to work seven days a week on the books. I love getting up ridiculously early (at 2am) and working through the morning. The best thing about my writing life is the writing I suppose; love the process. —the worst? Honestly, nothing. I love what I do and getting the chance to do it leaves me no room to complain about any aspect of my writing and illustration life. What would you do differently if you were starting out now as a writer? Nothing. I would do exactly what I have done up until now. Writing for me came at the right time. Finishing law gave me the discipline to tackle longer projects and my background in the visual arts gave me a way of making images that would get my book noticed. I think all the elements that have gone into making Mechanica were the product of 46 years and couldn’t have come earlier. What do you wish you’d been told before you set out to become an author? It’s all so new to me still so I can’t say I know enough to want to change anything. As a children’s author I’m competing with an exciting and engaging world of digital entertainment, I knew that when I decided to put he book together. While it is hard to get many children to put down their iPad to read a book, I think that authors can still produce books that cut through all the noise to create worlds that children love to explore. I hope I’m doing that with the Mechanica series. What’s the best advice you were ever given? There’s a song called ‘Work‘ by John Cale and Lou Reed that is about Andy Warhol. “It’s work, the most important thing is work…’ For me creating anything involves work – thousands and thousands of hours of work; most of which goes nowhere. You just have to keep going and write, illustrate or photograph something every day to progress forward. Drone armies, engineered by humans, have fought one another across the east and west, but during these battles, many became damaged and lost contact with their handlers. In an effort to overcome the species loss, robotics designers created Mechapets, complex robots that were crafted to resemble Earth’s lost but most exquisite insects and birds. The Mechapets were kept in sanctuaries and zoos for the public to enjoy, but it wasn’t long before some of the insects and birds escaped and began colonising lands, where they encountered some of the lost military drones. The Mechapets, now known as Mechanica evolved at a startling rate, increasingly becoming dangerous hunting machines. Battles were fought against the ruthless species of Mechanica, who threatened human existence. Protagonist Liberty Crisp has grown up surrounded by Mechanica. She has intimate knowledge of these robots, having learned about them from her parents, both scientists, and being taught by expert, Reginald P. Prescott. However, when the Steel Wall Defence System collapses on Saraswati, Liberty’s island home, it’s up to her to save its human inhabitants from almost certain destruction by the Mechanica. Mechanica is a dystopian tale for our times, appealing to us to live more sustainably and with a greater appreciation for our precious resources. I’m delighted today to introduce one of my fellow Wild Eyed Press picture book creators, Heather Charlton. A long time ago my father found me struggling to begin a primary school art construction project. To encourage a bit of resourcefulness he said: “Make something out of nothing and you will be all right.” His words motivated me to find a different way to make things work, and while I successfully completed the construction, I did not follow my father’s footsteps into an engineering career. Instead, I eventually undertook studies in fine art and have since enjoyed a creative journey in both business and pleasure. Among various endeavours including raising my family, part of my work life involved running my own floristry business, a commercial art studio and more recently the management of a remote Indigenous Art Centre. I enjoy the art-making process. Ideas for projects come from everywhere, and I scribble thoughts down quickly. I have written and illustrated several stories for children, have one picture book published and other works are in progress. Now, so many years later, my father’s words stay with me and I’m still making something out of ‘nothing’ to bring ideas to life. And I’m still all right. What’s the best aspect of your artistic life? Having the opportunity to spend time working with something I enjoy, and seeing the creative process through to becoming an actual product. How do you approach an illustration project? If the work is a book, I read the manuscript several times to get the feel of the story. If necessary I research the subject matter/characters, then read again. I make small quick sketches as ideas emerge as some of these may be useful later. When working on a book, I rarely make illustrations in order, often choosing the simpler ones first as a ‘warm up’. As the first and last pages are cornerstones to a picture book I like to leave them until most of the other works are complete. What are you working on at the moment? I am making preliminary drawings which will become paintings for a new children’s picture book. Are there any areas of art that you still find challenging? Making art can be both exciting and challenging, but I find experimenting with use of new media is sometimes outside the comfort zone. This is good however, as trying new tools can produce surprising outcomes. What would you be doing if you weren’t an illustrator? I am interested in many forms of creative pursuit, however ideally I would be sitting on a beach somewhere above the 26th parallel with pen in hand as my best-selling story unfolds, while a long line of publishers queue in the dunes. What do you wish you’d been told before you set out to become an illustrator? To join the Society of Children’s Book Writers and Illustrators. What’s the best advice you were ever given? Challenge yourself and keep trying . If it doesn’t work the first time, take a break then try to look at the problem from a new angle. What’s your top tip for aspiring illustrators? Buy the cookbook – ‘A hundred and one ways with mince’. When Hug first climbs out of his mother’s pouch it is spring, deep in the Australian bush. The trees are in blossom and new green growth is everywhere. As Hug grows, the season changes to the sharp dry crackle of summer. One day danger comes to the bush and Mama must flee to protect her baby, Hug. 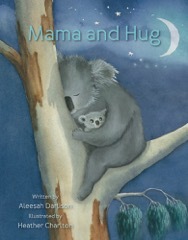 Aleesah Darlison’s tender story of a koala and her joey is delicately illustrated by Heather Charlton. Buy the book here. Matt’s top tip for authors? Protect the time you set aside for writing with your life. It is so easy to prioritise perceived obligations and the tasks you believe you should be doing ahead of writing because there are times when writing feels like a frivolous activity. Especially when you aren’t happy with what you are writing and when it isn’t being read. However, if I am not writing I don’t feel like I am living the way I want to. I lose my verve. And a life without verve isn’t worth living. So do whatever you need to in order to protect that time you set aside for writing. Let the people close to you know why it is important and put the time in your diary to write before you put anything else in there. What would you be doing if you weren’t a writer? Making music or performing theatre. Like writing they use language to stimulate the mind and stir the emotions. They delight in sound, pattern and meaning. Through their own language they mimic natural patterns and then violate the audience’s expectation to make a memorable experience. Perhaps this is why I enjoy performing my poetry so much. What was your toughest obstacle to becoming published? Convincing myself that not being published wouldn’t stop me from writing. That took ten years. Originally I wrote because of the way writing affected me. Once I graduated from university I wrote with the goal of being published in mind and I lost the joy. I didn’t write for ten years. When I started again it was because I wanted to feel that joy again. I eventually achieved my goal by no longer pursuing it. What’s the best aspect of your writing life? The unexpected moments when my subconscious takes over and it no longer requires effort. The question I get asked most often is, “how long does it take to write a poem”. The answer is very unsatisfying for the person. If I write every day then it will take a very short time and very little effort for me to write something I am proud of. If I don’t write every day then I won’t be able to write something I am proud of no matter how much time and effort I put into it. So the answer, from my experience, is that it takes writing every day in order for me to write a poem in less than an hour that I am proud to perform. —the worst? That my subconscious never asks for my permission to write about me and often the results are terrifying. The writing that I find most fulfilling and inspiring comes from my subconscious. The process of writing is transformed into an exhilarating experience which is similar to running through a maze in the black of night and knowing that there’s a Minotaur in there with me. The result of the process is that I come face to face with an aspect of myself that I was hiding from for a very long time. What would you do differently if you were starting out now as a writer? Believe in myself more and accept that rejection from close-minded people is a fortunate occurrence. It is hard to believe in yourself when you are pursuing something different to your school friends, family and peers. You feel unsatisfied when you are trying to fit in and you feel alone when you are doing your own thing. Eventually you realise that the more you do of what you love the more likely you are to end up in the same room with people who believe in you. That takes time to realise. What do you wish you’d been told before you set out to become an author? Playing it safe is a self-imposed death sentence to living the creative life you want to. There were times in my life when I allowed myself to believe in the illusion of security. I wanted to feel safe so I desperately wanted to believe that some jobs offered security in the form of a salary. I studied for those jobs and I worked in those jobs for years until I watched people get walked out of the building as soon as the business was in trouble. Today I find security in the activities that bring me joy and open my mind to new perspectives. There is no activity that offers me these things all the time, but reading and writing do so more than any other activity. 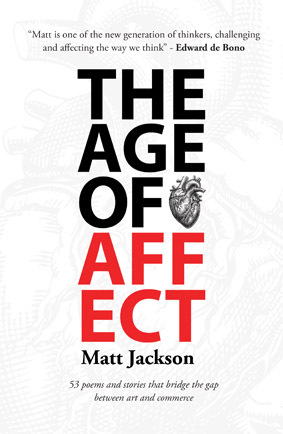 Filled with examples and relatable stories, The Age of Affect integrates what we can learn about the art of business and what the business of art can teach us.